Intended for the high horsepower street fan, the RST Street twin clutch kit is an economically priced twin disc clutch kit that does not include a flywheel( you use your existing flywheel). Able to handle 800hp, this clutch can handle almost any horse-power you can throw at it and still remain streetable. 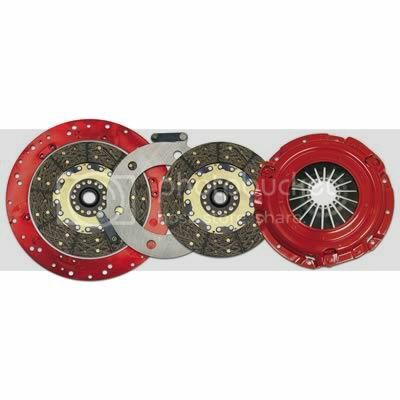 Organic lined clutch discs will provide smooth engagement with a soft pedal effort to make this clutch kit ideal for the street peformance enthusiast. Kit Includes: Pressure Plate, two organic friction discs, floater plate, adapter ring & aluminum flywheel.